The cable cars would never have survived in Britain. The unsmiling grey people who make the important decisions would have killed them off long ago. Inefficient, an accountant would have sniffed: they need two people to operate them instead of one. Dangerous too, a health and safety officer would have added: someone could jump or fall off the platform and go under the wheels and get squashed and sue us. They would have gone to the scrappers with London’s Routemaster buses. It almost happened in San Francisco in the late 1940’s, when the cable cars were coming up to 75 years old; but a citizen’s committee forced a referendum and won it. The cars are a National Historic Landmark now and, much as it might be a tourist cliché, few visitors leave without riding one. You have to wait in line for an age at the terminus up near Fisherman’s Wharf, but a car will eventually trundle down the hill and onto the wooden turntable set into the road. The stocky gripman and skinny conductor will jump out, lean against it and shove it round to face the other way. It is delightfully archaic. You stand on the platform and hang on to the pole in the open doorway. 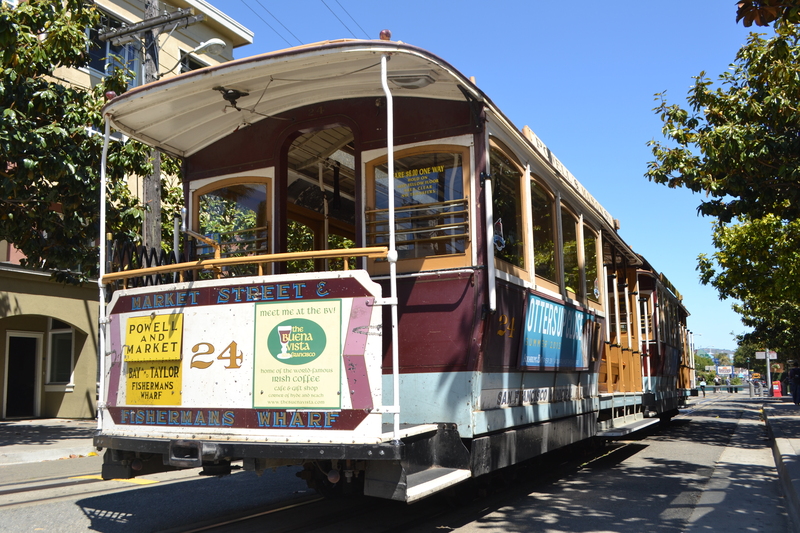 The conductor dings the bell and the gripman tugs on hefty levers and the car jerks forward and climbs through North Beach to the summit of Columbus Avenue and begins its descent downtown. Tourists whoop and scream as the car tips into the dizzying hills, as if they really believe you could fall off the edge of the world in the heart of an American city. But the gripman has the lever hard back so the car never gathers much speed, except on one or two corners when he lets it go so it can build up the momentum to get round. Then down, down, down, stopping at each block, as the gripman calls out the street name and some passengers jump off and some climb on; then clanking past Chinatown, glimpsing the other suspension bridge, the one no one cares about because it is not funky orange; tourists genuflect in the street to get action shots as the car rolls towards them, the gripman rings the bell to get them to move; and then on and down to the turnaround at Market Street in a quiet corner of the Tenderloin. It would, in truth, have been quicker to walk, much quicker to take the bus. But it would not have been half as much fun. Hi, I love your way of wording things. 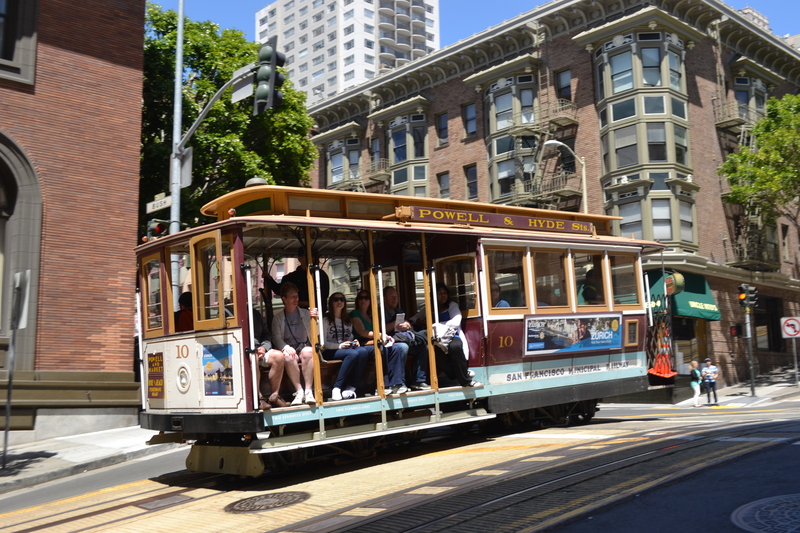 I visited San Francisco a few years ago and also loved the cable cars despite the fact they’re probably not the fastest method of getting anywhere.